(Flute Choir; arranged by Michelle Grondin). One movement work. Conductor score: 90 pages, 8.5" x 11", coil bound. Parts: 8.5" x 11", staple bound. Premiered April 30, 2012 in Minneapolis, MN. at Ted Mann Concert Hall, conducted by Michelle Grondin. (Flute Quartet: 1 Piccolo, 2 C Flutes, 2 Alto Flutes, 2 Bass Flutes). One movement work. 22 pages, 8.5" x 11". Premiered in February 2004 in Long Beach, CA. by The Los Angeles Flute Quartet: Eileen Holt-Helwig, Colleen Carroll, Lisa-Maree Amos and Peter Sheridan. Audio clips performed by The Los Angeles Flute Quartet. Plasma is a one minute recording created from the tracks recorded by the Los Angeles Flute Quartet. Composed for the 2004 VoxNovus 60 x 60 Project. Bioplasm is featured on The Los Angeles Flute Quartet's 2005 CD, Above and Beyond, on LAFQ Records. Click CD for more info. Bioplasm is featured on the 2007 Innova Recordings CD, Notes from the Kelp (innova 683). Click CD for more info. 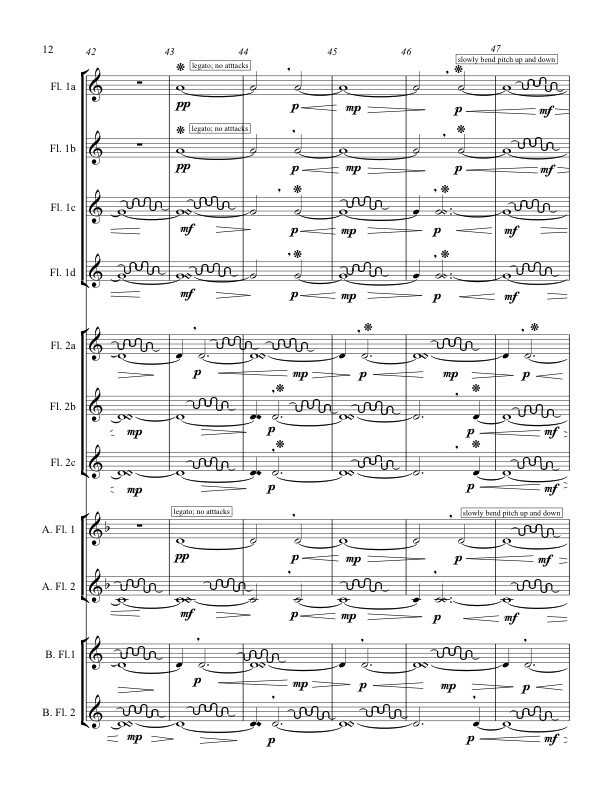 Score and parts available from Activist Music: $70.00, print; $50.00 digital. 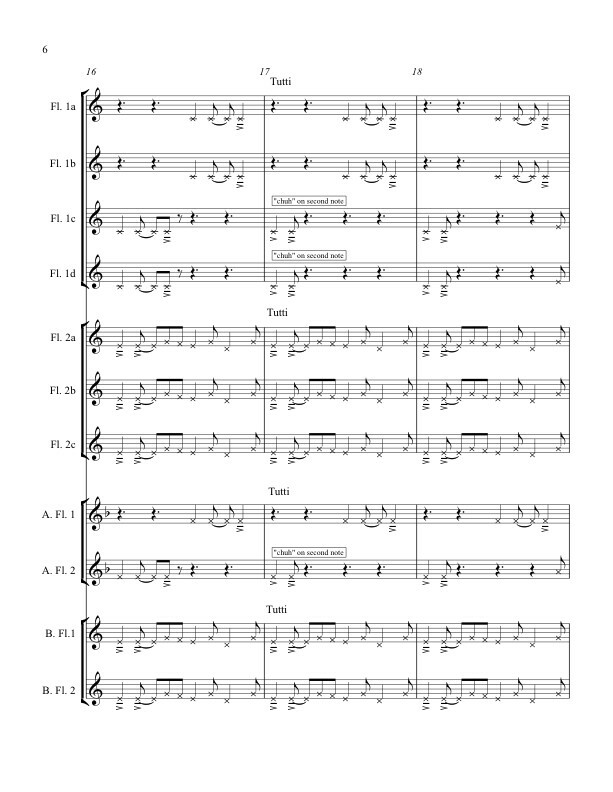 Conductor score available for $35.00 print; $15.00 digital. I named this piece Bioplasm because "Oozing Up From the Primordial Sludge" seemed a bit long for a title. Bioplasm is the stuff of life, the germinal matter that's essential for living beings to generate. This is a squishy piece: rather than exploit the individual voice of each flute, I wanted to create an organism that oozes across the sonic floor as one tethered entity, sometimes slowly, sometimes at a quick pace, but always as one, like a Slinky toy. The blend of homogenous sound with four flutes is a throbbing pulse of life; add to this human voices, and it's a choir of plasma, looking for life to begin. One of my heroes of both life science and the human condition was Lewis Thomas, author of many marvelous essays about our fragile planet. I happened to be reading one of his books, "Late Night Thoughts On Listening to Mahler's Ninth Symphony" as I began composing this piece at the MacDowell Colony in the fall of 2003, and reading his timeless observations moved me greatly. I dedicate this piece to his memory. Ms. Grondin’s Flute Choir setting of Bioplasm takes the "choir of plasma" to a whole new level. 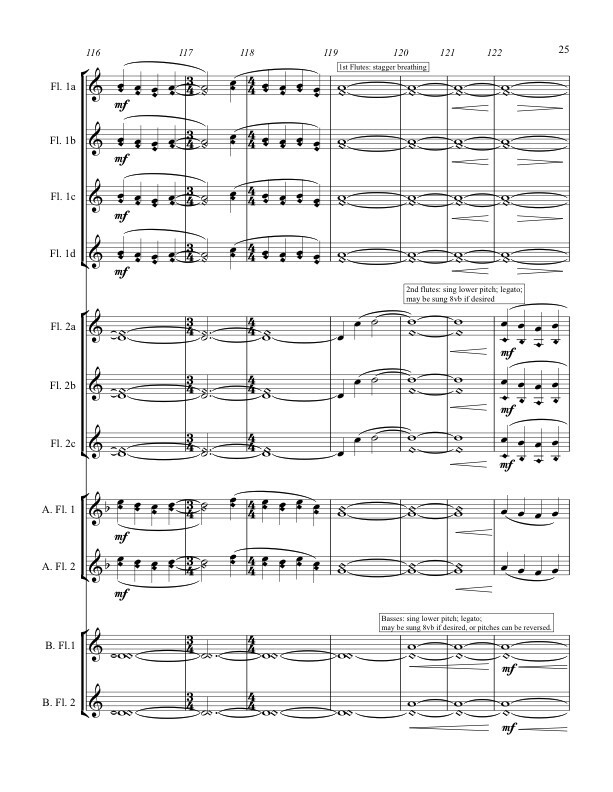 The re-orchestration has the ensemble morphing between two voicing sets (see diagrams), reminiscent of the original Flute Quartet voicing, in addition to including a few solo sections in which players slowly reunite with the choir. The ever-changing textures provide a constantly changing sound environment. Winner of a 2005 award from the Music Teachers National Association. Bioplasm has been featured on many radio shows across the U.S., including WNYC-FM's New Sounds program, hosted by John Schaefer in New York City, and KUSC-FM's program, Modern Masterpieces, hosted by Alan Chapman in Los Angeles. "The final work was Bioplasm, by Los Angeles composer Alex Shapiro, which flirts with theatricality and runs an eclectic gamut of styles, beginning with the pseudo-ritualistic entry of the quartet onto the stage, rhythmically clicking the keys of their instruments and blowing short, sharp breaths into the finger-holes. Later, there are passages that seem to evoke a more "tropical" mood and one episode of vocalizing along with the sound of the flutes, before the quasi-Andean music of the opening returns. [Bioplasm] was a particular favorite, receiving strong gusts of applause and even shouts of approval. As such, it was a well chosen finale, sending the audience home in an elated mood." "I am especially taken with the Shapiro "Bioplasm," a slightly bizarre but attractive new piece. I hope other flutists play it too." "From the evidence of their new CD Above and Beyond, with its commissioned works (especially Alex Shapiro's "Bioplasm"), the LA Flute Quartet seems poised to become the "Kronos" of the flute!" "The use of bass flute as percussion is not to be missed. A welcomed addition to anyone's collection of woodwind music. Especially delightful for flute aficionados." "Perhaps my favorite piece for listening is Bioplasm, which I first heard on Kalvos & Damian several years ago. This piece explores flute techniques (including noises, voices and multiphonics) in a tightly wrought architecture that feels leisurely and attractive on its surface. That's what I like about Bioplasm, for quartet of flutes (bass, alto, soprano and piccolo): It doesn't make experimentation into hard work... Bioplasm approaches the music with (dare I say it) a film composer's ear. In other words, I am not conscious of the music so much as the sensation." "Bioplasm, [Alex's] twelve-minute long flute quartet... jumps into a kettle of primordial soup, dabbling and splashing in agitated rhythms, cloudy ambiances, dense textures and open outcries. The flutes combine into a mysterious surface area, all undulation, ripples and bubbles, obscuring the individual melodic lines into a surreal sort of audioplankton." 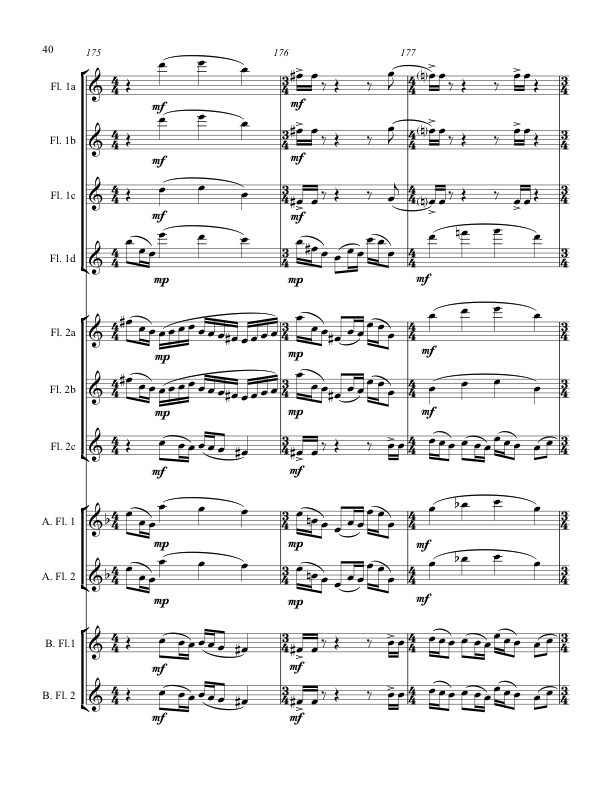 "[Bioplasm is] an eerie and curiously haunting tone poem written for flute quartet — 2 C flutes, 2 alto flutes, 2 bass flutes, and 1 piccolo — that incorporates some uncommon flute techniques such as percussive pitched key clicks and pitch bending (the latter sounding just as the words suggest, and both new to this writer) as well as vocalizations by the players while they’re playing (no, we have no idea how that’s done, but we’re assured that no overdubbing was employed, and that none of the four flutists were harmed in the making of the recording), that requires more than one listening to appreciate fully in all its details." 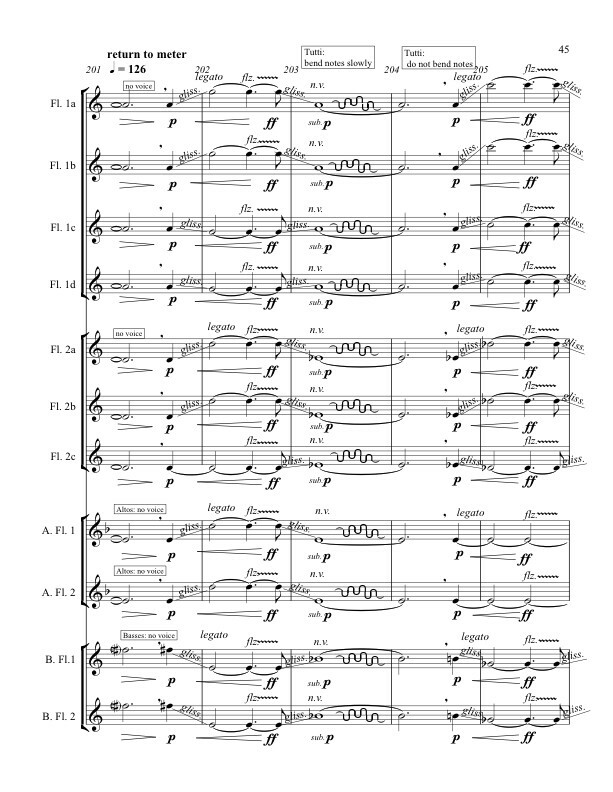 "A percussion honorable mention has to be given to "Bioplasm," written for flute quartet. Here the flutes are used as percussion instruments, creating a "throbbing pulse of life" with their keys and air stream. Later the players are called upon to sing, sometimes with what sounds like a multiphonic effect." 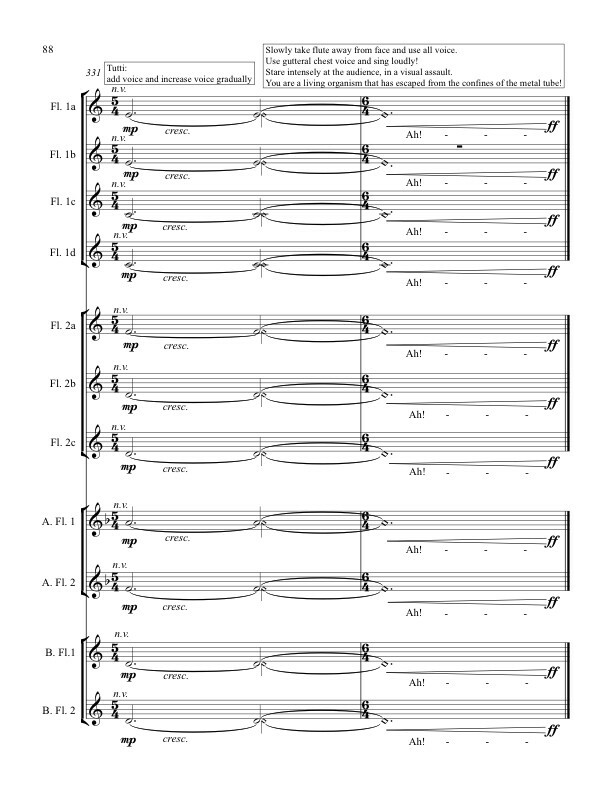 Bioplasm, for choir, page 40: yes, there is a lot of "normal" music in this piece, too!